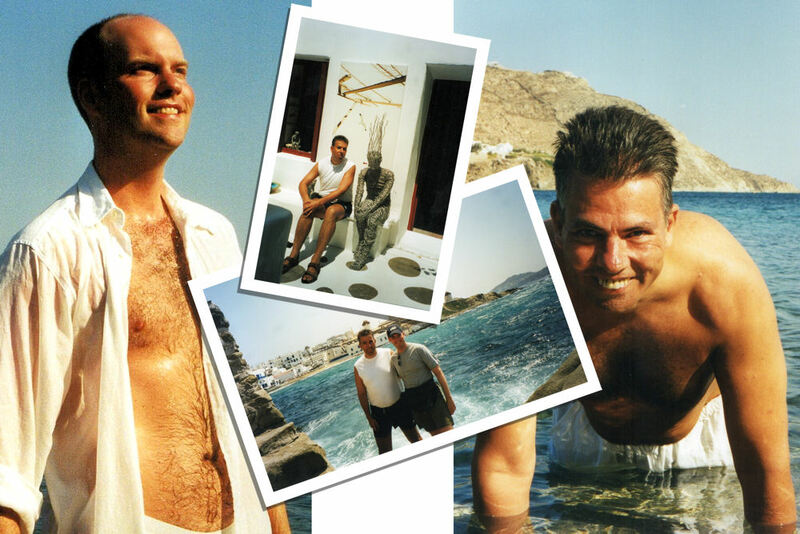 Georgenick's Greece and Mykonos page 1999 and 2000 - a personal web site celebrating food, friends, and good times. Mykonos. Delos. 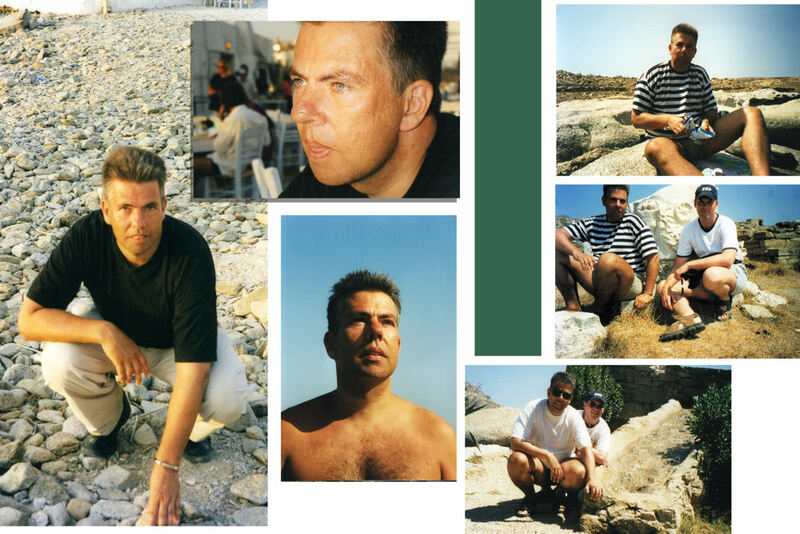 Gay Mykonos. Porta Bar. Giles. Hidden Cave. Santorini. This page was re-designed and tidied up in 2018, with older, wiser ideas and fond, if hazy memories of the past. After being together for a year, we decided to go on a big vacation together, island hopping in Greece. 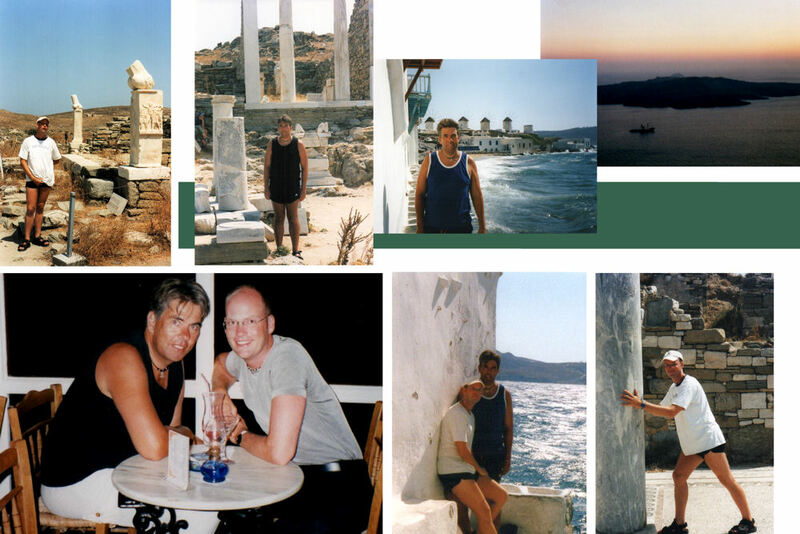 We flew to Athens with just our backpacks and took the ferry to Santorini, with no accommodation booked in advance. 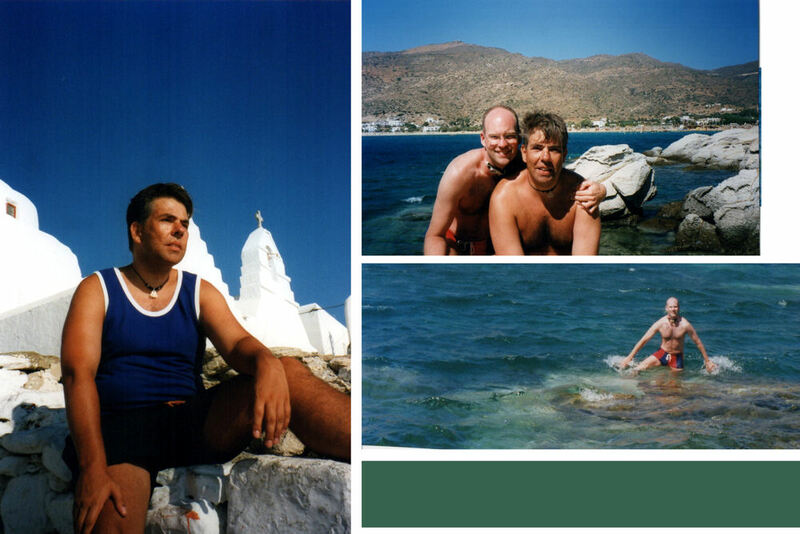 We then went on to Ios, where we camped at the rather noisy Purple Pig campsite, Naxos, where we sampled Mama's delicious meatballs, and finally Mykonos, where we fell in love with the island. We were in Santorini on August 11th, a Catholic holiday, and were given free food at the celebration pictured above. What a welcome! We spent a lot of time on ferries. The sunset view is from a restaurant in Santorini. I remember a barking dog below. We got dressed for nights out at our campsite. The one pictured above was in Mykonos, and it was very windy. 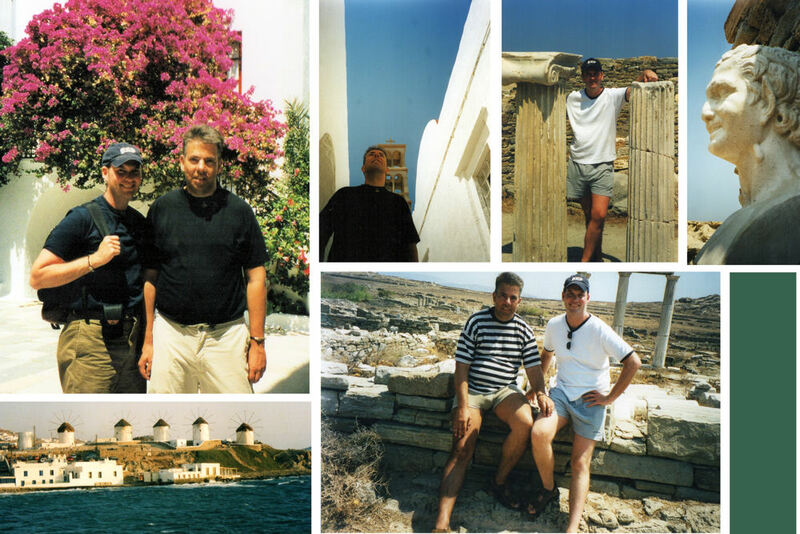 This must have been our first trip to Delos, where we were free to roam among the ruins. I hope it is always as accessible as this. Also pictured is our very first (of many) martinis. This is one of my all-time favourite photos of Nick. I used it to create the paper cut artwork above our piano. Our tent, one of my last sunbathing holidays, and a photo from Athens. Ask me about the Iannis anecdote sometime. 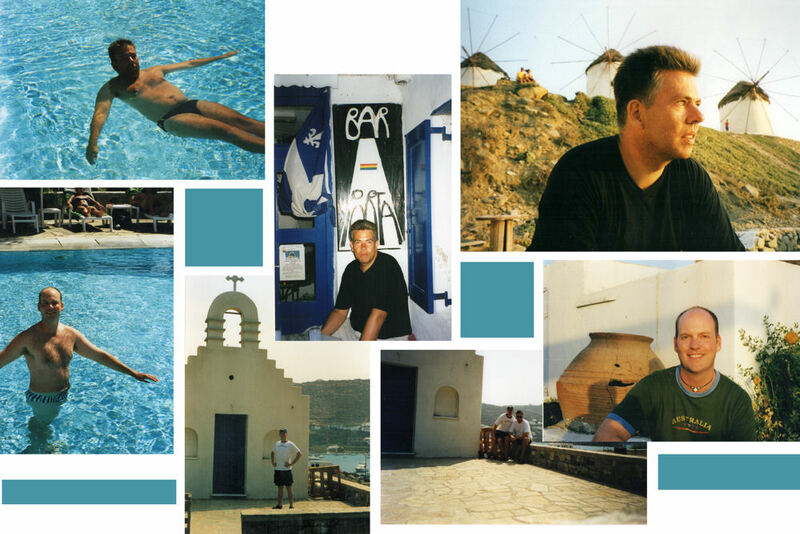 We returned to Mykonos in August, 2000 for another unforgettable two weeks of beautiful sunsets, crystal clear waters, late night bar hopping, and reading by the pool. We visited the beach where Shirley Valentine was filmed and explored a hidden underground cave on the mystical isle of Delos. 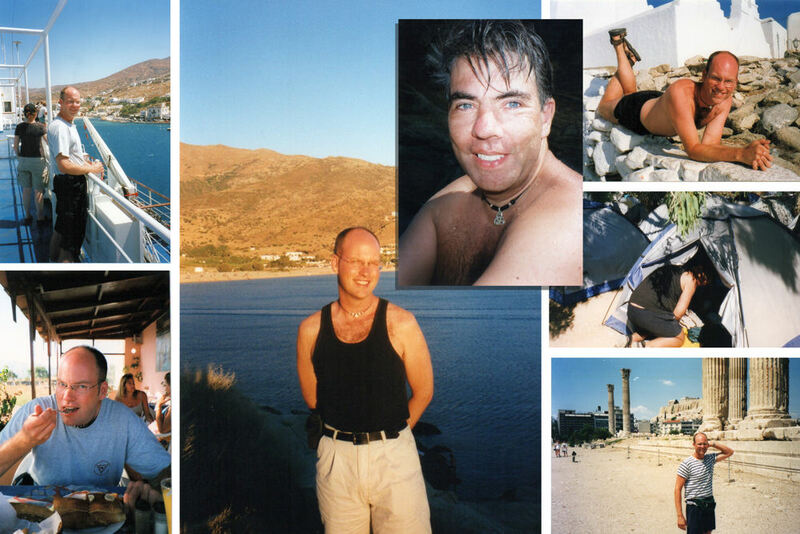 We sunbathed sans swimsuits and had professional photos taken at some of our favourite locations. If you'd like to read more about our trip, I've written up a fun account for you. I hope you enjoy the photos below. We certainly enjoyed making them. Giles was our friendly French barman at Porta bar. He owns his own Magic Bar now and is still in Mykonos, as far as I know. We tended to shop for new clothes in Gap before our holidays. We'll be back to Mykonos again one day. Meanwhile, there are photos from 2005 to see.